A new paper suggests women can remember faces better than men, in part because they spend more time studying features - without even knowing it. In our modern science miracle culture, they have determined that you, also, can get a better memory. In just minutes a day. More importantly, studies may help to answer long-standing questions about why some people can remember faces easily while others quickly forget someone they've just met. "The way we move our eyes across a new individual's face affects our ability to recognize that individual later," explains Jennifer Heisz, a research fellow at the Rotman Institute at Baycrest and newly appointed assistant professor in the Department of Kinesiology at McMaster University, who co-authored the paper with David Shore, psychology professor at McMaster and psychology graduate student Molly Pottruff. "Our findings provide new insights into the potential mechanisms of episodic memory and the differences between the sexes. We discovered that women look more at new faces than men do, which allows them to create a richer and more superior memory," Heisz says. Eye tracking technology was used to monitor where study participants looked—be it eyes, nose or mouth—while they were shown a series of randomly selected faces on a computer screen. Each face was assigned a name that participants were asked to remember. One group was tested over the course of one day, another group tested over the course of four days. "We found that women fixated on the features far more than men, but this strategy operates completely outside of our awareness. Individuals don't usually notice where their eyes fixate, so it's all subconscious." The implications are exciting, she says, because it means anyone can be taught to scan more and potentially have better memory. "The results open the possibility that changing our eye movement pattern may lead to better memory," says Shore. 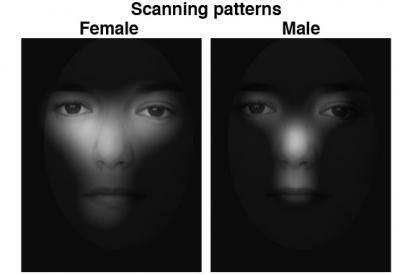 "Increased scanning may prove to be a simple strategy to improve face memory in the general population, especially for individuals with memory impairment like older adults."